After suffering defeat five times by Frankel, the Aidan O'Brien-trained Excelebration finally enjoyed his moment of glory when romping away with the Queen Elizabeth II Stakes at Ascot. The four-year-old gained his first Group One success in Britain, and third in all, with a superb victory. Although there were worrying moments when he had to wait for the gaps to come, when they did the 10-11 shot eased up to Cityscape before powering clear to score easily by three lengths, with long-time leader Elusive Kate three and three-quarter lengths away in third. The winning trainer said: "We are delighted. He's been working brilliant. He's got an awful lot of speed and class, and Joseph was confident. The lads did a great job with him at home. 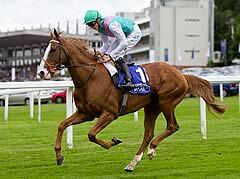 "We rode him different that day (behind Frankel in the Queen Anne Stakes). We probably learnt a lot and he's progressing. If he's OK and everybody is happy we'll go to the Breeders' Cup." Excelebration is in his first season with O'Brien having formerly been trained in Newmarket by Marco Botti. The Ballydoyle handler added: "He was a good two-year-old and three-year-old and it has taken us a while to get to know him. He is getting quicker and heavier with every run. I had a fair idea what Joseph wanted to do and he had a lot of confidence in the horse. 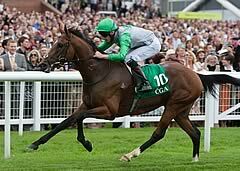 "When we ran against Frankel in the Queen Anne we tried to match strides with him and that was the wrong thing to do. Speed is his forte and he probably did well to be second that day." Asked about the possibility of Excelebration staying in training, O'Brien said: "The better he gets the more the boys want him (for stud), it's something we will have to discuss at the end of the year." O'Brien jnr said: "He's improving with racing and he's an exceptional horse. The ground makes no difference to him and he has a lot of pace. He's a six- and seven-furlong horse with a lot of speed and he gets a mile no problem. "He's run some very consistent races and I've probably sacrificed him a couple of times against Frankel, trying to race up against him four out. My horse has to be ridden for speed. We have learnt that throughout the year and I nearly got nabbed for second here earlier in the year trying to beat Frankel." The globetrotting Cityscape could have run his last race after finishing a gallant second to Excelebration in the Group One Queen Elizabeth II Stakes Sponsored by QIPCO. “I’m quite emotional about Cityscape because he is such a good horse with so much talent. I’m proud of him for being so consistent,” said trainer Roger Charlton. “We worked out that he had travelled 55,000 miles to five different countries this year and he’s just always there or thereabouts. The winner was impressive today and has a great turn of foot.